There is 1 holiday to Dolomiti Superski for 2 adults, 0 child and 0 infant. Chalets are often associated with rolling mountain scenery and being able to nail the cosy, homely atmosphere of holiday accommodation. The catering will add a touch of the easy-going too as you can have a week off from the kitchen and let someone else do the work. What’s more, Italian chalets are a bit of a rarity so when you do come across one you like the look of, it's well worth considering. Selva is one of the Val Gardena resorts and has excellent access onto the Sella Ronda; Chalet Soldanella might as well be ski-in, ski-out with only a 50m walk to the nearest lift and Chalet Salvan is a smaller option - great if you’d prefer to have sole occupancy. 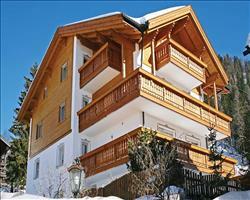 Chalet Violetta and Chalet Traviata are in Canazei which is the largest resort in Val di Fassa. Not only is it a beautiful valley but the après ski scene is worth checking out. For a bigger property in a bigger resort, have a look at Chalet Hotel Parc Victoria in legendary Cortina.